Following the timeline of the last Dirt Sheet History looking back at April 2006, we get a glimpse into the top scoops from May of 2006. We dive into the news getting ready for ECW One Night Stand 2, start to see the signs of Kurt Angle’s body breaking down and get all the juicy gossip on the Batista vs. Booker T fight. Reminder that you can find all editions of Dirt Sheet History looking at 2004 and 2005 right here at this very link. Now enjoy May 2006! * Kurt Angle is said to be showing more and more signs of wear and tear from the business. He has cut back dramatically on prescription pain killers, but he has been feeling the effects from it. He lives with constant pains, but is looking to tough it out. * SLAM! Wrestling reports that JBL will challenge Rey Mysterio at Judgment Day for the WWE Championship. In a related story, more reports indicate that JBL will face Rob Van Dam at the ECW One Night Stand pay-per-view. While not confirmed, look for RVD to cash in his money in the bank contract for a chance to become WWE World Heavyweight Champion. * The overall reaction amongst WWE employees on Joey Styles’ promo from last night was one of absolute shock. Apparently, many people in the company share the same views as Styles voiced in his promo on RAW last night, but would never speak out against Vince McMahon. Everyone was surprised that Vince and Stephanie would allow material of that nature to air live on RAW. * According to Dave Meltzer, the decision is final and John Cena will be Rob Van Dam’s opponent in the main event match at the ECW One Night Stand PPV this June. Apparently WWE will be using this opportunity to officially turn John Cena heel after being booed by fans for months. It also appears that this will be when RVD will cash in his “Money In The Bank” title shot, thus indicating that Cena will continue to retain the WWE Heavyweight Championship. This entry was posted in Dirt Sheet History, More Things! and tagged 2006, Dirt Sheet History, ECW, WWE on June 19, 2014 by Joey. Following the timeline of the last Dirt Sheet History breaking down the best inside scoops from the Summer of 2005, we’re ending the year checking out the final three months of news. 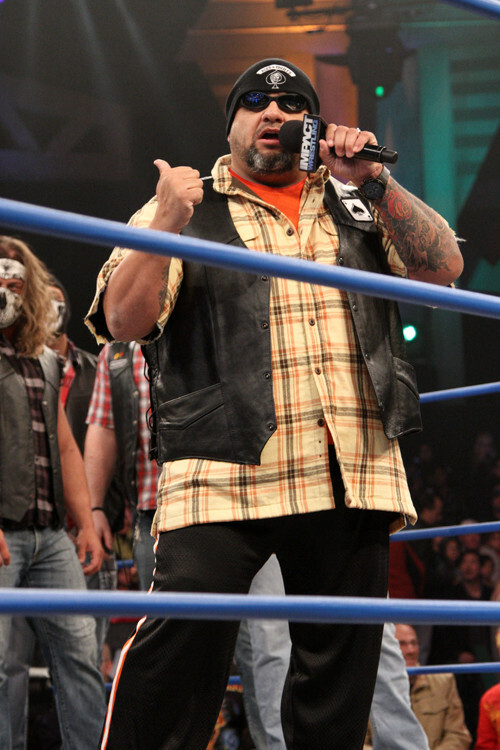 * The rating is in for Saturday night’s TNA iMPACT debut on SpikeTV – the show did a 0.8. While not the home run rating SpikeTV was hoping for, this is a strong number and something both Spike and TNA can be proud of. The real test will be seeing how the show does over the next 2 months. If they can maintain that viewership base and grow to a 1.0, it will be a good sign of long term potential. * Vince McMahon will return to RAW this Monday to ‘fire’ Jim Ross on-screen so that it would make sense for him moving to WWE.com Unlimited. It is said that Ultimate Fighting Championship announcer Mike Goldberg has accepted the multi-year contract WWE has offered him, and could be on RAW this Monday. It is unknown if their will be a storyline for Goldberg coming in, or he will be presented as the new announcer immediately with no explanation. * Spike TV asked TNA to remove a segment at the end of Impact where Team 3-D looked into the camera with the middle finger raised and asked those in Stamford, CT to “trademark this”. TNA had no problems removing the gesture. This entry was posted in Dirt Sheet History, More Things! and tagged Dirt Sheet History, ECW, TNA, WWE on April 22, 2014 by Joey. Following the timeline of the last Dirt Sheet History breaking down the best inside scoops and rumors from the road to Wrestlemania 21, we see what happened during the Wrestlemania 21 event and afterwards. Delving deep into the Matt Hardy/Edge/Lita saga and going all the way to the first ECW One Night Stand reunion PPV, here’s Dirt Sheet History from April through June 2005. * In a surprising note, following his World Heavyweight Title victory over rival Triple H, the first person on Batista‘s list to hug was none other then Triple H’s father. Triple H’s mother was also at the show, situated alongside her husband on the front row. * There was a positive mood for last night’s PPV, with people generally thinking it delivered strongly. That being said, there was slight concern that the crowd seemed a little dead after John Cena‘s title win. That apart, everything went the way the company wanted it to. This entry was posted in Dirt Sheet History, More Things! and tagged Dirt Sheet History, ECW, Wrestlemania on March 21, 2014 by Joey.